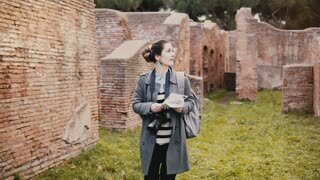 Camera follows young woman with backpack walking among ancient red brick ruins in Ostia Antica, Italy, on vacation trip. 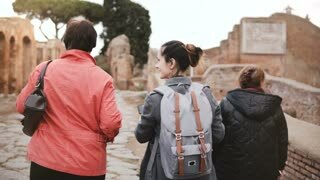 Camera follows young excited traveler woman with backpack expolring ancient historic red brick ruins of Ostia, Italy. 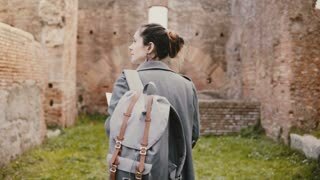 Back view of excited young female student researcher with backpack and map exploring ancient ruins in Ostia, Italy. 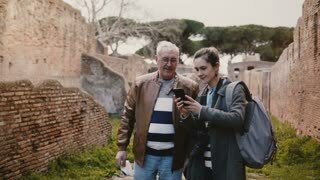 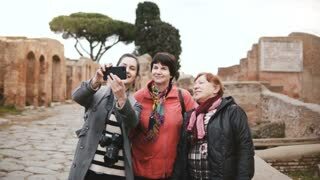 Two tourists, young woman and older man, enjoying exploring old ruins of Ostia Antica in Italy during vacation trip.